Although there are some excellent wooden balance bikes available from manufacturers such as Kiddimoto, Boppi and Prince Lionheart – the majority of balance bikes on the market today are made from metal, and a large number of those are made from lightweight steel. The technology used to create balance bikes is very advanced, so this means that steel balance bikes can be tough, lightweight and can take most of the knocks that a 2, 3 or 4 year old can throw at them! Steel balance bikes are welded together to form the main frame of the bike, and this is then enhanced with extra features with saddles, handlebars and the various types of tyres that are available. Steel balance bikes are much closer in appearance to a real bike than wooden balance bikes, and they can also be painted in many different colours, so there is a huge range available from bright pink to oasis blue and stylish red or green. Another benefit of steel balance bikes is that they are usually more adjustable than wooden balance bikes. This means that a good steel balance bike should be able to last your child from learning to ride until when they are ready to graduate to a pedal bike. Steel balance bikes are also usually able to accommodate heavier riders than aluminium bikes, so once again if you choose a bike with a large range of saddle heights it should take them from learning to ride at 2 or 3 through to a much larger bike. Steel balance bikes do have some disadvantages. They are not as environmentally friendly as wooden balance bikes which are usually made from materials such as recycled birch plywood. Additionally, if you get a chip in your bike it could turn to rust over time. However, they should not rust over the course of their lifetime, unless they are left out in the rain – which we would not recommend! Finally, although steel balance bikes closely resemble ‘real bikes’ in appearance, they cannot be painted in quite such a large range of funky patterns and styles like the Kiddimoto range of bikes. This is not really a disadvantage, just one of the differences between the types of bikes. There is a huge range of steel balance bikes available so it is impossible to review them all here. However, we have selected 3 bikes at different budgets to give you an idea of the range of bikes available. 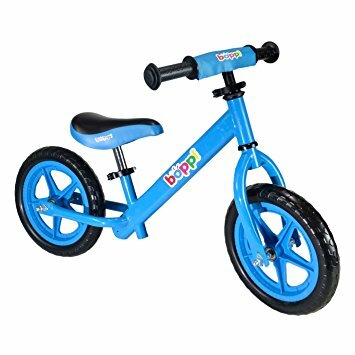 The Boppi metal balance bike offers great value at just £35, and it includes a strong and light tubular frame with an adjustable padded seat and padded handlebars. The frame weighs just 3kg, so this is an ideal bike for 2 or 3 year olds and the saddle height starts at 30cm. It can be extended up to 40cm so this means the bike should have a good lifespan. 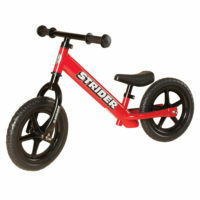 The Strider Classic balance bike is one of our very favourite balance bikes and an excellent choice for most age groups. It has a huge range of features with an adjustable saddle from just 29cm and a lightweight metal frame which also weighs 3kg. This bike also includes a frame integrated footrest, so this provides the child with a place to rest their feet when gliding or even performing tricks. EVA foam tyres are also included. The Strider Classic balance bike is priced at £66, and if you like Strider bikes you could also consider the Strider Sport for £88. 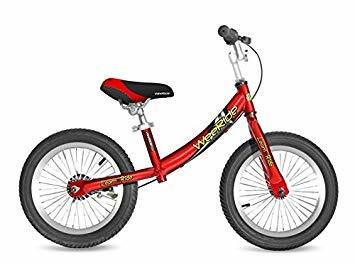 This high quality balance bike is suitable for older children that are not yet ready to ride a pedal bike, as it has a 14 inch frame and a much higher saddle height starting at 45cm. It has a beautiful Weeride paint finish, a stylish two-tone seat and proper air tyres which provide more ‘give’ and therefore a more comfortable ride. The bike also features a hand brake, which is a useful accessory for older children as well as non-slip hand grips. The Weeride Deluxe balance bike is available for around £100. These are just a selection of the many steel balance bikes available, with other excellent options also available from Puky, Bike Star and Specialized to name just a few. You should also make sure that your bike has the correct fit for your child, and don’t forget about other essential accessories such as selection a balance bike helmet.